Cleverly compact, the Lulu Brushed Steel Stool Black has an exclusive design that is also practical for small spaces. Sleek lines and smart finishes give the Lulu its contemporary appearance, ensuring it has a high-quality look that will always impress. Black faux leather covers the rounded seat smartly and is filled with thick padding for great comfort. A low lip backrest completes the seat to offer reassurance when seated. Utterly upmarket, the frame displays a muted brushed steel finish for modern chic. Within the frame is a gas lift mechanism enabling easy height adjustability, as well as 360-degree swivel. Finally, the curved footrest is both stylish and supportive, whilst the sturdy round base includes an underside guard to help protect floors. 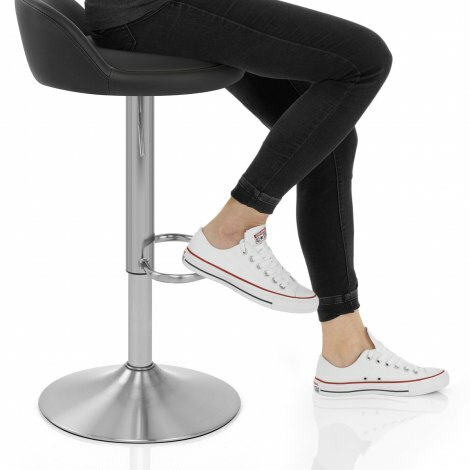 "Excellent service, easily assembled and very comfortable"
After looking for quite a while for stools that we liked we found these stools and couldn't be more pleased. Excellent service, easily assembled and very comfortable.